Searchlight Resources Inc. (TSXV:SCLT) is a resource exploration company with a growing portfolio of high-quality, advanced-stage exploration projects close to existing infrastructure in premiere North American jurisdictions. The company’s flagship property is the Bootleg Lake gold and VMS base metal project located in Saskatchewan—rated the top mining jurisdiction in the world by the Fraser Institute in 2017. Bootleg Lake is a mere 5 kilometers from Flin Flon, Manitoba—home to Hudbay’s 777 underground copper-zinc-gold-silver mine which lies along the Flin Flon-Snow Lake belt, one of the world’s most prolific mining belts. Searchlight Resources is compiling and conducting a detailed review of the historical data on the Bootleg Lake property along with GIS and 3D modeling. The company’s near-term exploration plans for Bootleg Lake include surface mapping and sampling, geophysics and diamond drilling during the second half of 2017. Searchlight Resources’ latest addition to its portfolio is the Munro Warden copper-nickel-cobalt project in Ontario’s world-class Abitibi Greenstone Belt. Following a detailed compilation of the existing data, Searchlight Resources Inc.is planning near-term exploration at Munro Warden which will include prospecting, geophysics and geological mapping. Also in Ontario, the company’s Samuels Lake nickel-copper-cobalt project is located in an area of active copper, nickel, PGMs and cobalt exploration.Searchlight Resources’ is working to create a 3D model of the Samuel Lakes mineralization using drill data from Teck Cominco and ProAm drill campaigns. The modelling and review of the data will help the company delineate targets for a future drill campaign. 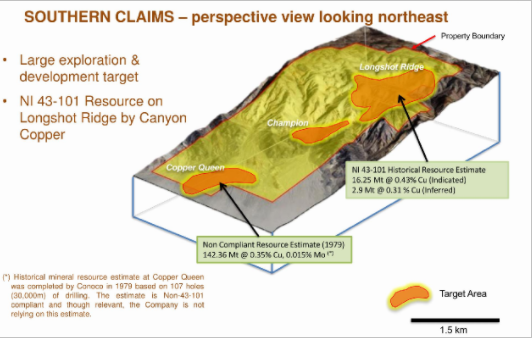 Searchlight Resources’ New York Canyon copper project in Nevada has a NI 43-101 resource estimate of indicated 16,250,000 tons at 0.43 percent copper and inferred 2,900,000 tons at 0.31 percent copper. Searchlight Resources is seeking a joint venture partner for the project. Portfolio of properties in top-rated mining jurisdictions with near-term exploration programs. 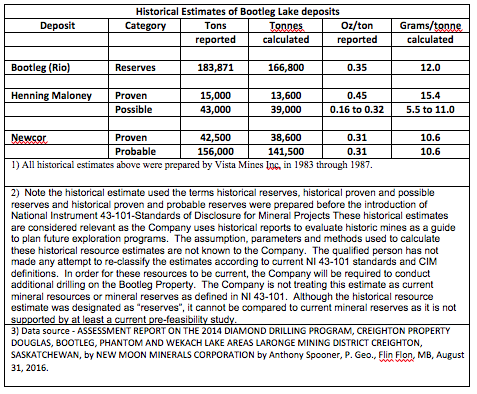 Bootleg Lake project—high-grade gold and VMS targets in Flin Flon area; historical resources. Munro Warden project– historical drill data of 4.9 percent copper and 0.27 percent cobalt; grab samples up to 1.7 percent nickel, 1.77 percent copper and 0.14 percent cobalt. Samuels Lake project—geologically similar to Lac des Iles mine; two significant exploration programs conducted in 1998-2001 (ProAm Explorations) and 2007-2008 (Teck/Cominco). New York Canyon— NI 43-101 resource estimate of indicated 16,250,000 tons at 0.43 percent copper and inferred 2,900,000 tons at 0.31 percent copper. The Bootleg Lake Gold Project hosts high-grade gold and base-metal volcanogenic massive sulphide (VMS) targets near the city of Creighton, Saskatchewan, and five kilometers from Flin Flon, Manitoba. 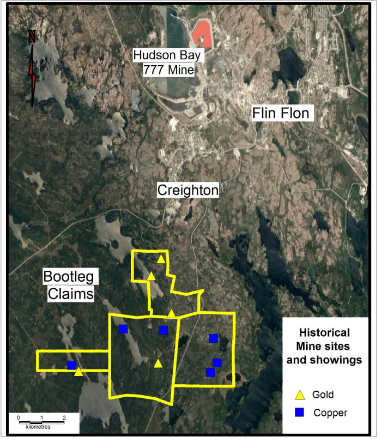 Searchlight Resources has the option to earn a 75-percent interest in the 3,718-hectare property which contains three past-producing gold mines with historic estimates: the Bootleg/Rio Mine, the Henning Maloney Mine and the Newcor Gold Mine. There are also a number of additional gold and copper occurrences on the project including possibly mineralized tailings from previous production. Excellent exploration infrastructure is in place, offering the potential for lower cost exploration at Bootleg Lake. “With multiple high grade gold targets including historical estimates and within minutes’ drive of the mining center of Flin Flon, Manitoba, Bootleg Lake represents a high-quality prospect with low cost exploration,” said Stephen Wallace, President and CEO of Searchlight Resources. Management believes the Rio Mine area, which remains underexplored at depth and along strike, shows the most immediate potential. A large-scale target lies in the Rio Fault Corridor with more than 3 kilometers in strike length from the Rio mine to the Henning-Maloney mine and continues west. The Newcor Corridor area hosts a VMS-related target. The Munro Warden copper-nickel-cobalt project covers 7,171 hectares in the eastern portion of the Kidd-Munro assemblage of the prolific Abitibi Greenstone Belt. The Kidd-Munro assemblage hosts a number of mineral deposits, including the Kidd Creek VMS deposit, the Dundonald and Alexo komatiitic-nickel deposits as well as numerous significant lode gold deposits and copper-zinc bearing massive sulphides. Searchlight Resources has the option to earn up to a 100-percent interest in the property. The results of historical drilling include 4.9 percent copper and 0.27 percent cobalt, and grab samples have measured up to 1.7 percent nickel, 1.77 percent copper and 0.14 percent cobalt. 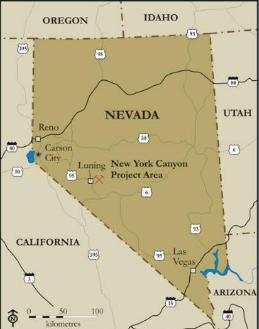 Searchlight Resources’ wholly-owned New York Canyon copper project covers 1,690 hectares in the southeastern portion of Mineral County, Nevada. Three mineralization zones have been identified along the west-northwest structural trend of the property: Copper Quest (west), Champion (center) and Longshot Ridge (east). Copper oxide deposits were first discovered in this region in 1875 with first recorded production from the district between 1906 to 1929 including a historically estimated production of 8.9 million pounds of copper at an average grade of 5.5 percent copper from numerous small surface showings on the Longshot Ridge area. Stephen Wallace has 30 years of mineral exploration and development experience from grassroots evaluation through to mine development, and has fulfilled roles in the exploration industry from field geologist to corporate executive. Success includes the position of Senior VP, Exploration and Director of Trade Winds Ventures Inc. (TSXV: TWD) a gold exploration company, which was acquired by Detour Gold Inc. in 2012 for $84.0 million. At Trade Winds he was instrumental in advancing the Block A gold project prior to the takeover, with this project becoming Detour Gold’s planned West Detour open pit mine. John Kerr graduated from the University of British Columbia in 1964 with a Bachelor of Applied Science (B.A.Sc) degree in Geological Engineering. He has participated in the mining industry continuously since graduation as an exploration geologist. Successful ventures include recognition and discovery of the Santa Fe gold mine, identification of the Calvada gold mine located on the northern boundary of the New Canyon property, and discovery of the Mindora gold/silver deposit, all located in Nevada. Kerr has served as a director of numerous public companies and is currently a Director of Quaterra Resources (NYSE Amex: QMM, TSX.V: QTA) and Bravada Gold Corp (TSX-V:BVA). James Yates is an independent businessman with extensive experience in resources and development. Yates founded Hycroft Resources & Development Corporation, which developed the Crofoot property in Nevada, a gold heap leach producer for over 20 years, known as the Hycroft mine. He is a founding director of Alpha Exploration, which developed a uranium deposit and merged with Fission Uranium with a valuation of $189 million in 2013. As a director of Nevada Geothermal over $200 million was raised for the development of a geothermal plant. Yates has continuously been involved in establishing and financing numerous public companies. Brian Crawford, CPA, CA, has over 30 years experience as a senior financial executive of private and public corporations. A former partner in a national firm of chartered professional accountants, Mr. Crawford is currently the CFO, Corporate Secretary and a Director of several Reporting Issuers. Peter Dueck has been involved in the resource exploration industry since 2001, working with a variety of gold, copper, zinc and uranium companies. Until early 2018, he held the position of Chief Geophysicist for Hudbay Minerals Inc. in Flin Flon, Manitoba. At present Mr. Dueck is the President of Pioneer Aerial Surveys Ltd a wholly owned subsidiary of Global UAV Technologies, Ltd., which is provides a full spectrum of Unmanned Aerial Vehicle “UAV”-based services and products. He was a founder of Aerial Imaging Resources, Inc. (AIR), a UAV-based geophysical survey company acquired by Global UAV in 2018. Dueck holds a B.Sc. in Geophysics from the University of Saskatchewan as well as an MBA from the University of Wales. *Disclaimer: The profile provides information which was sourced and approved by Searchlight Resources Inc. in order to help investors learn more about the company. Searchlight Resources Inc. is a client of the Investing News Network (INN). The company’s campaign fees pay for INN to create and update this profile page, to which links are placed on Investingnews.com and channel newsletters. By completing this form, you are giving consent to receive communication from Searchlight Resources Inc. using the contact information you provide. And remember you can unsubscribe at any time.